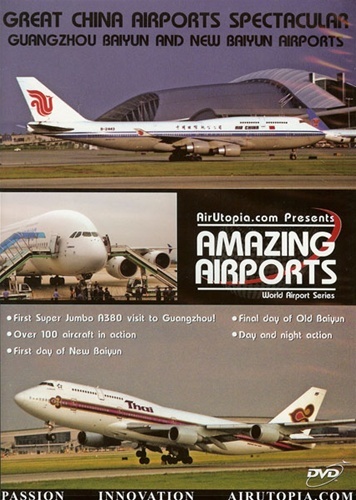 Witness Chinese aviation history as AirUtopia records the historic opening of one of China's latest gateways to the world, Guangzhou's New Baiyun Airport! Exclusive and rare final day footage from the former 72 year old facility is combined with all the excitement of first day operations at the new airport. Locally based China Southern Airlines is thoroughly covered along with the many other domestic and international operators as well as the special first-ever visit of the Airbus Super Jumbo A380 to Guangzhou! 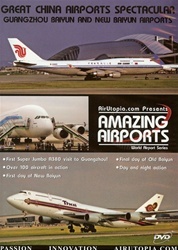 Another must-see production from AirUtopia's 'Great China Airports Spectacular' collection! First A380 Super jumbo visit to Guangzhou! Special 2 airport combo - over 100 aircraft in action! Opening day action at New Baiyun!